Summertime and the living is easy — aside from the sweltering temperatures. When the season kicks into high gear it’s difficult to figure out what to wear. Even paper-thin layers begin to feel heavy. While we love exploring the local shops under the sun, we prefer to get our fresh air fix under the stars. New local markets featuring the best art, vintage and original clothing, pins, accessories, furnishings, baked goods and brews arrive this summer with late start times. The Indie Market announced the launch of a new monthly event — Summer Nights Exchange. This gathering of makers takes place the fourth Friday of each month, from 7-11pm, at Green Bench Brewing. Summer Nights Exchange is a collaboration between the Indie Market, Florida Folk Scene and Black Amethyst Tattoo Gallery. In addition to the 50+ vendors at the brewery, the event will also feature an art show, interactive installations, music, and a tattoo art show. 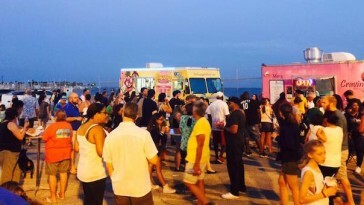 St. Pete Side Lot’s Night Market returns on Thursday, July 13, from 7-11pm. The third installation in this late night shopping extravaganza squeezes in even more amazing local vendors for their summer event. Shop for clothes, candles, art, greeting cards, jewelry and more while noshing on local bites and brews. This event is meant for the whole family. St. Pete Side Lot’s market, located at 2133 2nd Avenue South, features a kids fun zone and it’s pet-friendly. A DJ will provide high energy music throughout the evening. On July 8 and August 12, from 5-10pm, Urban Deli and Drafts hosts the Fringe Flea Market. Participating vendors include 9 Lamps, Fox + Crow and Wahine Ki. Fringe Creatives is still accepting applications for vendors. Live music, amazing food from Urban Deli and Drafts and more will add Burg energy to the evening.